Japan's TV production shakedown shows no sign of slowing | What Hi-Fi? Last November I wrote a blog piece suggesting that – in consumer electronics at least – 'Made in Japan' was in danger of giving way to a future in which products may still be designed by the big names, but they'd be made outside Japan by companies based in China, or other lower-cost manufacturing territories. Since then, we've seen Panasonic and Sony buddying up to develop OLED TV technology – for TVs likely to be made in China or Taiwan –, and Sharp looking for ways of cutting the cost of making its sets rather than running big, expensive Japanese factories. Meanwhile, other manufacturers are examining ways of – well, doing a lot less manufacturing. Sharp's deal with Taiwan's Hon Hai Precision Industry, the world's largest manufacturer of consumer electronics, running huge plants making products for many of the world's top brands, was finalised last week. Hon Hai Chairman Terry Gou's SIO International Holdings paid ¥48.9bn (almost £400m) in cash on top of a previous payment of ¥17.4bn (£142m) made earlier this month. 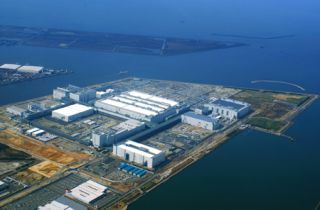 That secures the company a 37.61% stake in Sharp's state of the art LCD panel factory in Sakai, western Japan (below) – the same holding Sharp retains. That's pretty small change for Gou, whose company's Foxconn makes products for Apple and many other well-known names: last year it had revenues of $92bn (£59bn), up almost 20% year-on-year, and is on track to hit $100bn (£64bn) in 2012. In addition Sharp is issuing new shares in the Osaka prefecture-based division to two Japanese printing companies, Dai Nippon and and Toppan, so the facility will no longer be one of its consolidated units. Sharp shares rose in Japan as investors saw the move as casting off loss-making parts of its business. The move comes as another Japanese TV company, Toshiba, follows through on its ending of domestic TV production with the announcement that its television design and development operations, until now a separate division, would be swallowed up by its digital development division in Ome, near Tokyo. TV development will now run alongside PCs and tablets, in a further sign that all kinds of digital audio-visual products are now converging in the technology they use. The move comes after Toshiba announced that it would by next year reduce the range of TV models it offers by some 60%. It adds that its digital products business 'operates in a fast-changing global environment that has recently seen significant demand decline in the Japanese TV market, rapid price erosion, significant demand growth in emerging economies and a diversification of devices with the growing popularity of new devices such as tablets. However, what all Japan's TV brands are watching with a mixture of interest and some nervousness is the seemingly unstoppable rise of Chinese manufacturers of TVs and the display panels they use. Yes, the big Chinese companies may offer a reliable source of lower-cost panels, thanks to their use of highly automated plants using state of the art equipment, but that same productivity could see them displacing familiar Japanese brands, while at the same time having the R&D and financial muscle to take the lead in technology, too. For example, BOE Technology Group (left), which has a new plant near Beijing, has already overtaken Sharp to become the world's fifth-biggest panel maker, and is now snapping at the heels of the Taiwanese and South Korean display companies. BOE, which had sales of 12.74bn yuan (almost £1.3bn) last year, is already looking at advanced methods for making LCD screens, and plans to start making OEL panels, initially for smaller devices, at a plant in Inner Mongolia next year. With LCD TV panel prices falling to a fraction of previous levels in recent years, making it hard for even the major South Korean manufacturers, let alone their Japanese rivals, to make a profit making displays, China looks like the 'go to' location for the future of TV manufacturing. Korea's big two, the world's leading TV manufacturers, are looking to China for their future production: as I reported a couple of months ago, both Samsung and LG are constructing Chinese plants, LG in Guangzhou and Samsung in Suzhuo. With China now the world's largest consumer of TVs, with 44.52m sets shipped there last year, the balance of power in the global TV business seems likely to continue its move away from the established players and into the hands of companies such as BOE and Hon Hai. And it'll be the next-generation of hi-tech TVs they'll be making, such as those BOE recently demonstrated to high-ranking Chinese politicians (above) in Beijing, not just 'made to a price' models able to undercut the top names.